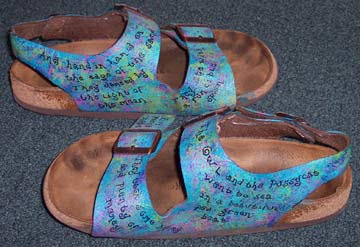 I shared this pair of painted sandals before, but I thought I should show you a second pair and maybe suggest that it might be a nice project for a quick pair of summer wearable art. I don’t like buying new shoes. In fact, I tend to wear the same pair of sandals all year, even in the snow. When they get worn out, I do buy a new pair (the exact same style…aren’t I exciting? ), but I can’t stand to just throw out the old pair. So I usually paint them. 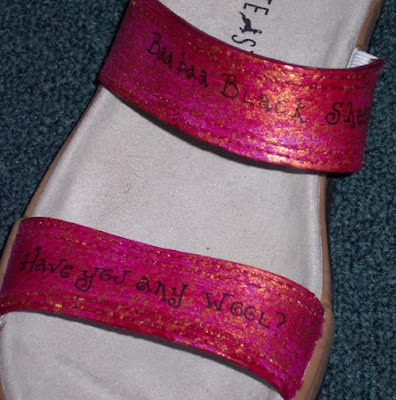 Acrylic paints, a black fine-tipped marker, and clean sandals are all you need! 1. Choose your colors of acrylic paint: a main background color and a couple of accent colors. 2. 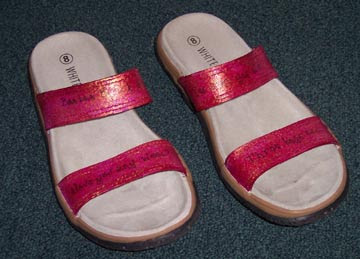 Using a sponge or foam brush, paint all the leather surfaces of the straps with your main color. Mine was Cobalt turquoise. Let the paint dry. 3. Lightly sponge on your accent colors. I’ve always found that I get a better look if I return to my main color last, and lightly sponge it on as if it were also an accent color. Make sure you let the paints dry between colors. 4. Using a fine-tipped black marker, write or doodle whatever you want. 5. Use a heat gun to help set the colors and words further. Don’t get it too close or the paint may bubble. 6. Spray your shoes with a light coating of Krylon acrylic fixative. The paint doesn't crack with all the flexing a shoe gets?! I love these - so unique! Nope! It soaks into the leather pretty well.